Now we shall examine older or long-standing muscular injuries, and also those of the tendons and ligaments. Injuries that have occurred years earlier present a unique set of challenges. If enough time has passed, the muscle may have changed shape or even become atrophied. (Shrunk) In turn, this atrophy or change of shape may have effected the role of surrounding muscles, causing them to perform unnatural actions (actions for which they were not originally intended) in order to assist or protect the damaged area. And finally all this may have also resulted in an actual change to the firing order of various nerves governing certain movements. When working with these deeper muscular issues as well as with tendon and ligament problems in Zhan Zhuang, it is often necessary to go beyond the basic Wuji posture in order to achieve success. While it is possible to heal or least improve the above conditions, I want to be clear that full recovery is oftentimes a ‘long and winding road’ which can take years if the damage is profound enough. That said, as one who has healed these types of injury on himself, I want to assure you that with enough Gung Fu - perseverance, time and effort, it definitely can be done! Since with deeper injuries choosing the correct posture or postures is paramount in inducing repair, the specific location of the problem will often help dictate the proper choice(s.) So say for instance the problem is in the tendons or ligaments of the elbow. Depending on the exact location, the Wuji posture with its downward elongated arms may suffice. But since some of the primary movements of the elbow involve turning or twisting, variations of the ‘Holding the Ball’ Posture, may also be needed. These include 1) the ‘scooping’ of the forearms, wrists and palms rotated under and slightly upwards. 2) releasing the forearms, wrists and palms until they exactly, face the torso. And finally 3) relaxing and untwisting the forearms, elbows, wrists and palms until they face the Low Dan Tien or are even parallel to the ground. This may also include temporarily condensing all the upper extremities in order to work with the ‘weakest link’ in the muscular chain. The idea with this is that we must respect the reduced facility and range of motion in the injured area and reduce the stretch of the perfectly good surrounding tissues and even be willing to modify the bone structure, distance and angles accordingly. See Inside Zhan Zhuang, Pages 126-135 for more info. Of course along with all this, we will also employ the Station Method going from the spine to the rhomboids to the scapula to the Teres muscles, Deltoids, biceps/triceps, elbow, forearm, wrists and hands. The result of finding the right balance with all this will often play out in the deep relaxation and gentle expansion and lengthening of the palms and fingers. In addition to the above example, we must also consider the angle that the forearms are holding, and the direction the tip of the elbow is pointed; from facing the ground to 45 degrees to all the way up to the elbow tips parallel to the ground and everywhere in between. Each of these postural variations will create differing pressures and stresses on the elbow joint itself. Try a number of variations to find the best angle, the one that provides the most relief and relaxation. Tendon and ligament injuries are generally far more challenging than even deep muscular ones. The reason for this is in their relationship to the bone. Tendons at one end are attached to a bone and ligaments are often fused to numerous places along a bone(s). In addition to this, severe injuries to the tendons and ligaments almost always involve a major hyper-extension, if not outright tears. Over-elongation as it applies to the tendons and ligaments creates a condition of loss of ‘springiness’ or even a general ‘loosening’ of the joint. According to western thought this ‘loosening’ cannot be returned to anything like its original state. What they suggest is to either strengthen the surrounding muscles or have surgery. While strengthening the nearby muscles can be helpful, unfortunately it does little to tighten or shorten the tendon or ligament and return its elasticity. And remember, it is this very elasticity that is necessary for the transmission of higher level Fa Jin. Let’s say the problem is in the Medial Meniscus on the inner side of the knee. The Meniscus is the circular-like cartilage that joins the femur bone to the tibia and fibula bones. The medial or inside section of the knee is particularly challenging in that the fewest arteries and veins pass through that area than anywhere else in the body. So the restoration of circulation in such a region is additionally formidable. But once again, it is possible. 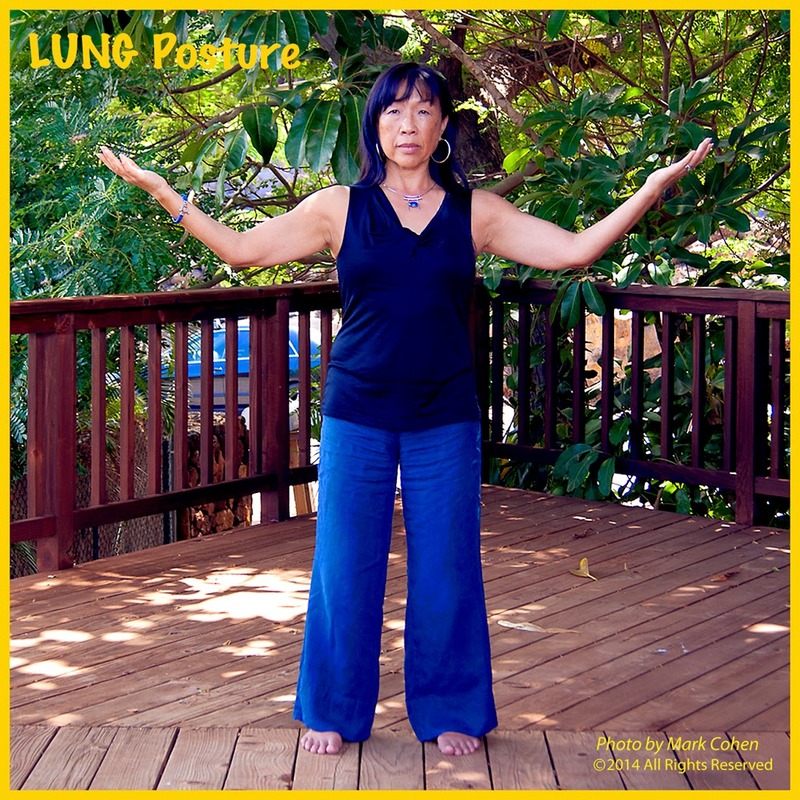 Start by assuming a Wuji posture, feet parallel at the ‘Natural’ width. 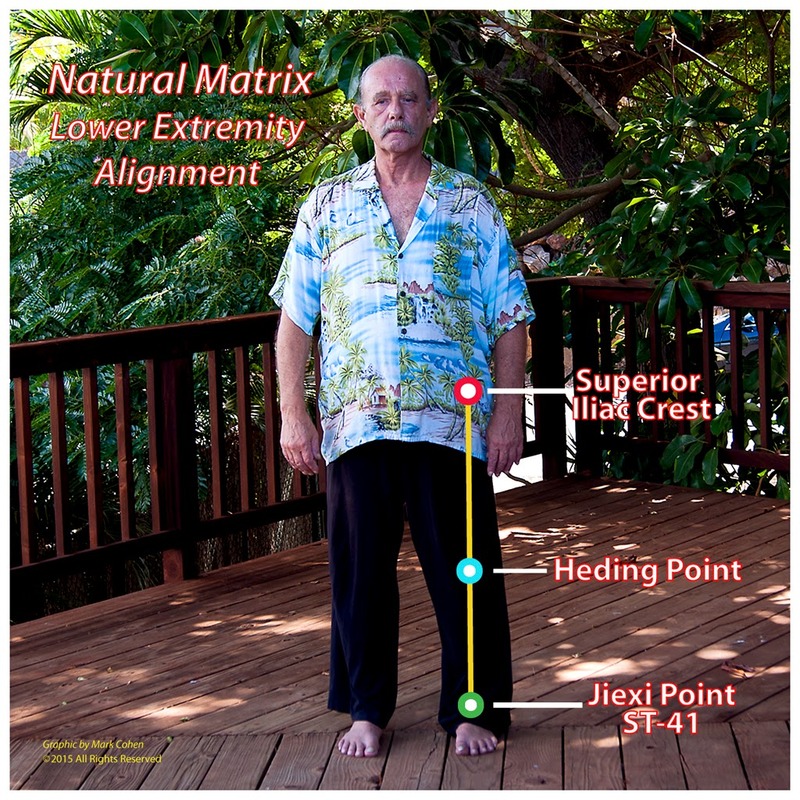 The Natural width or Universal Matrix, is the distance where all the bones in the hips and lower extremities naturally line up and support one another. The Superior Iliac Crests, Heding Point (just above the kneecap) and Jiexi point ST-41 (between the two tendons at the center of the ankle) all fall in a straight vertical line. For some this position may cause too much ‘stretching’ or twisting’ (spiraling) in the hips, back and/or Kua. In that case it is permissible to turn your feet slightly outward a few degrees in an equidistant manner. And be sure to keep the Iliac Crest-Heding point-Jiexi point alignments when you do this. This will immediately take pressure off the Lumbar/Sacral region. That said, if at all possible, use the feet-parallel position for best results. 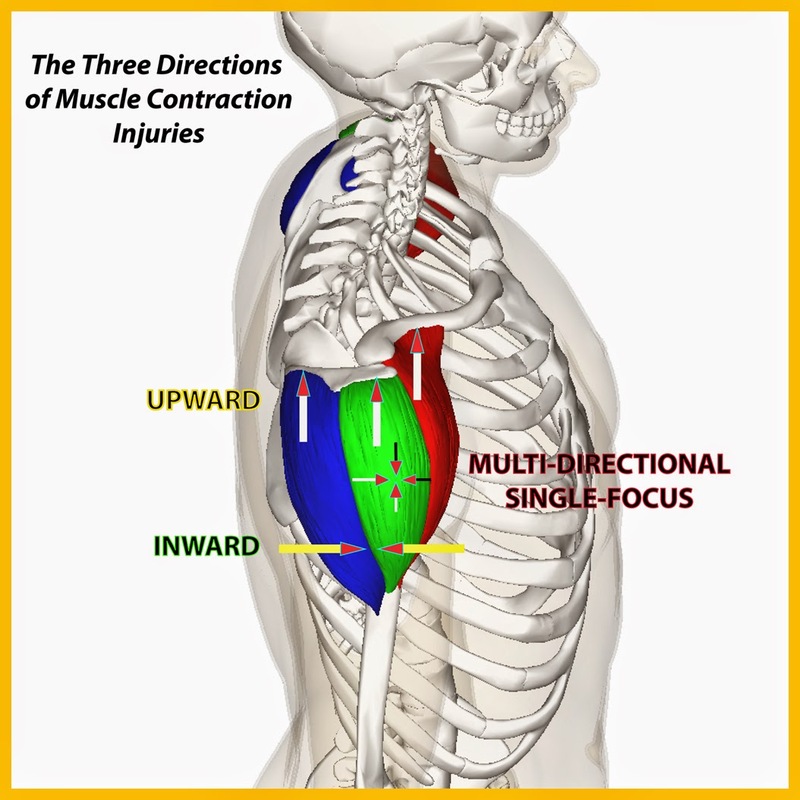 Since any serious injury of the type mentioned will involve the unnatural tightening of muscles above the damaged site and also sometimes below or to either side, it becomes imperative to activate the Station Method to begin with. Once this is done, we next need to release the muscles that attach in the Inguinal Creases down the inside of the thigh through the weakened area at the inner side of the knee. This will assist in the softening and re-elongation of the Adductors, Gracilis, Rectus Femoris etc., which will very probably have at least tightened or even locked in order to protect the injured area from taking too much weight. Remember also, that allowing our weight to move into the Yang Channels of the leg also implies a slight shift of our Central Equilibrium back toward the heel, and the Yang Channels (Bladder and Gall Bladder) of the back and back of legs. This is similar to the basic backward Zhong Ding weight-shift described in Part 2. Now, with certain very severe injuries to the inside of the knee, including partial or full dislocation, at least initially, the damaged region will be unable to bear very much weight, if any. To address this challenge with Zhan Zhuang we have two possibilities. The first is to assume the Wuji posture described above then quickly shift sideways so that the majority of the weight is in the uninjured side. This lateral Zhong Ding shift is quite similar to the weight shift in Tajiquan’s Yun Shou - Cloud Hands. Depending upon the vulnerability and what is appropriate we will end up with weightings anywhere from 60%-40%, (larger numbers represent the weighted, uninjured leg) to 70%-30%, 80%-20%, 90%-10%, or 100%-0%. The second possibility for such extreme circumstances is to adopt a “Single-Weighted” Stance where all or very nearly all of our weight is on the rooted leg/foot and the other leg is empty. Of course using such a posture will require a much finer balance than with its two-footed cousins, therefore it is best to start with a relatively short amount of time for beginning sessions. When adapting the Single-Weighted stance for healing it is also wise not to extend the empty leg too great a distance from the rooted side. In the next part we will shift gears and look into Internal Organ issues and how we can use Standing Meditation to improve many of these conditions. When we begin Zhan Zhuang training many of us have the goal of settling into a totally relaxed, deep meditative state that initiates healing of the body and cultivation and accumulation of internal power which can later be harnessed in combat application. However, before we reach such a state, there are often a number of obstacles that must be surmounted. While some of these are mental and emotional, most have to do with adjustments in the physical body, either in the physical structure itself or within the body’s internal functions. The signal that things need to change and reach a finer balance is generally some form of discomfort or pain. The healing process in Zhan Zhuang can be likened to the peeling back of the layers of an onion. 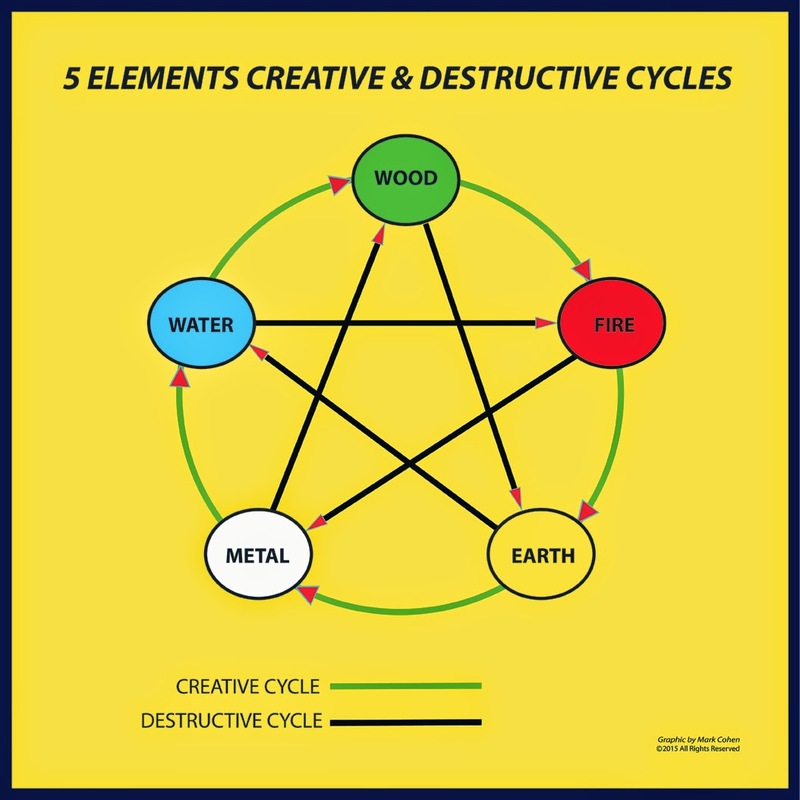 The outer layers can be considered the discomforts or imbalances that we first encounter, while the root causes are buried deep inside or even in our core itself. It is said that our body records and remembers everything that has, is and will happen to it throughout our lifetime. This is often called Cellular Memory. Experiences such as old injuries and the like, if left uncorrected can lead to negative engrams (root patterns) within the body. The good news is that with continued Standing Meditation practice, one day these will come to our conscious awareness where they can be dealt with and resolved. We are probably quite well acquainted with some of these patterns, while others may be far deeper inside the energetic structure of the body and as such are mostly masked to our normal awareness, except perhaps for some strange, fleeting feelings, subtle enough to almost pass under the radar of our conscious feeling-awareness. For example, this is like when in the past we have injured ourselves and the injury apparently ‘got better on its own.’ But the fact is, there could easily still be some residual traces remaining which continue to mar our physical and/or energetic systems and over time can act as a drain on our overall energy by eating away at our reserve. This type of blockage is usually fairly insidious and as such can unknowingly cause decay both internally and externally. The idea here is that one part of the body often effects other parts, and many times these parts are seemingly extraneous or unrelated to the original problem. So the inevitable question becomes: How do we deal with these obvious blockages/imbalances? And later, how do we root out and address the deeper and more subtle ones lurking within each of us?